> Products>Theology and Doctrine>One Bible Only? 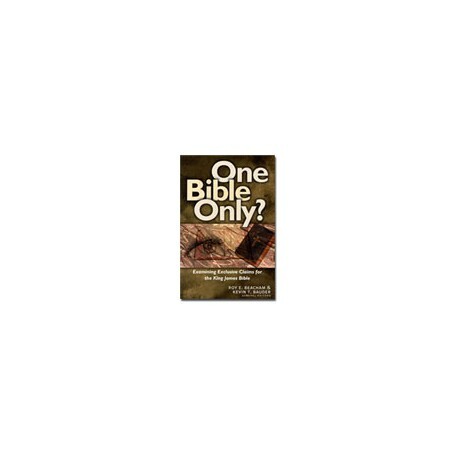 This honest examination of the "King James Only" position offers a balanced and scholarly presentation of the issues based on biblical and historical evidence. The debate over the accuracy of modern translations of the Bible continues to create confusion in the minds of believers who know that Scripture lies at the heart of the Christian faith. Yet many don't understand why some believers insist that the King James Version is the only accurate translation of the Bible. “King James Only” proponents claim it is the only choice for those who want the “inspired” Scripture as their guide for faith and practice. Pastors and church members alike need solid, sensitive answers to the ongoing questions they confront regarding the KJV. While you may not agree with the conclusions, you will benefit from this honest analysis of the textually critical issues surrounding the KJV-only position. And you can be confident that the discussion in One Bible Only? advances a consistantly high view of Scripture.